Just to add my too cents in on the Elvis and the Beatles summit, from what I got from the Beatles Anthology, John seemed to have memories that the other Beatles didn't have about the meeting. I think John had claimed that they jammed with the King, but none of the other fabs had any recollection of that. New York, NY (October 17, 2011)—One of the most beloved cultural milestones of the ‘60s generation and every generation since, Sgt. Pepper’s Lonely Hearts Club Band by The Beatles, gets creatively interpreted and re-imagined in this all-instrumental rendition by a guitarist whose lifelong love of this material has resulted in an album that transcends all musical boundaries and genres. Two years in the making, guitar fans, Beatle fans and everyone in-between will come together when Favored Nations Entertainment releases Andy Timmons Band Plays Sgt. Pepper on October 24. “This is an extension of what I started on my Resolution album in 2006,” explains Timmons. Andy Timmons has recorded nine solo CDs of intricate guitar work; has served as Olivia Newton-John’s Musical Director for several U.S. tours and has been an in-demand studio six-stringer for the likes of Paula Abdul and Paul Stanley of KISS. He’s shared stages with Joe Satriani, Steve Morse, Ace Frehley, Ted Nugent, The Beach Boys, Steve Vai, Eric Johnson, and Leslie Gore. In the early ‘90s, he sold over a million records as lead guitarist with Danger Danger. Truly, Andy Timmons is a renaissance man whose guitar work can fit any genre. The George Harrison: Living In The Material World Exhibition opened at the GRAMMY Museum in Los Angeles on October 11, and runs through February 12, 2012. The Los Angeles Times reports, "[The exhibition] offers an unusually intimate look into the public and private lives of one of the most intensely public and private people in pop music history." On display are several of George's guitars, including his 1957 Gretsch Duo Jet and 1961 Fender Stratocaster known as "Rocky," as well as a new groundbreaking interactive app showing each guitar on display with the guitar's history, facts and playlists. Other priceless artifacts available to view up-close and in-person in the magnificent exhibition include handwritten lyrics, outfits, postcards, sketch books and diaries - covering George's early school years, his days of Beatlemania, through his solo career and the Wilburys recording sessions. John , Paul , George & ????? Somewhere, an aging drummer (identity unknown) is probably still kicking himself. A newly discovered letter found folded in a book at a Liverpool yard sale has shed new light on the Beatles' early days, revealing that Paul McCartney offered an audition to a mystery drummer in 1960, just a few days before the band left for a formative two-month gig in Hamburg, Germany. The letter, to be auctioned next month by Christie's, has surprised Beatles scholars. It was written two years before the band bounced drummer Pete Best in favor of Ringo Starr, who arrived just in time to help the Beatles' conquer first England and then the world, earning untold millions along the way. The Aug. 12, 1960 letter handwritten by McCartney offers an audition to someone who had advertised their availability in the Liverpool Echo newspaper four days earlier. The unsigned ad said simply: "Drummer-Young-Free." McCartney, who was then playing guitar in the band while the late Stuart Sutcliffe handled bass guitar, offered the drummer an audition with the caveat that if he joins the band he must be ready to travel almost immediately to Hamburg. The Beatles honed their musical chops playing at low-rent clubs in the German's city's famed red-light district. "Expenses paid 18 pounds per week (approx) for two months," McCartney writes. "If interested ring Jacaranda club." The letter is signed, "Yours sincerely, Paul McCartney of the BEATLES." It is not known if the drummer came for an audition, and failed to impress McCartney and the others, or if he simply didn't follow up. McCartney addressed the letter "Dear Sir," assuming the drummer was a young man, as there were very few female drummers on the Liverpool rock scene at the time. Bruce Spizer, author of "Beatles For Sale" and other books about the band, said the Beatles were desperately looking for a drummer to take to Hamburg and eventually chose Best, in part because Best "had a drum kit" and because his mother ran a nightclub where the group had played. "This shows that Pete wasn't the only person they were interested in," Spizer said. "They needed a drummer and Pete was convenient. It makes sense that they would have responded to some drummer in Liverpool looking for work. My speculation is that two months in Hamburg intimidated him, maybe he didn't want to go and never replied. If he had responded, and if he was good, it might have changed everything." Christie's spokeswoman Leonie Pitts said the auction house's Beatles experts are certain that the letter was not an early feeler to Starr, who was a successful drummer with a rival Liverpool band, Rory Storm and the Hurricanes, before he joined the Beatles. She said auctioneers had not contacted McCartney to ask if he knew anything about the drummer who had placed the ad. "We think he's on his honeymoon," she said. McCartney married U.S. heiress Nancy Shevell eight days ago. His representatives did not immediately return a request for comment. Christie's auction house said Monday the letter would likely draw more than 7,000 pounds ($11,000) when it is sold Nov. 15 along with other pop memorabilia. The letter was discovered by a man from Liverpool who has asked to remain anonymous. The auction house said he is a devoted collector of antique coins who regularly checks yard sales. New York, NY (October 19, 2011) -- It was one of the most emotional documentaries ever aired on the Showtime Cable Network. Now, for the first time, on December 6, fans will have a chance to own The Love We Make, a look back at Sir Paul McCartney and his efforts to plan and perform a benefit concert in the aftermath of the worst day in the history of New York City. Eagle Rock Entertainment will release the film, directed by Albert Maysles (Gimme Shelter) and Bradley Kaplan, on DVD [MSRP $14.98] and Blu-Ray [MSRP $19.98] [Pre-book Order Date November 11]. Shot in stark 16 mm black and white, complete with color concert clips, The Love We Make juxtaposes dramatic images of "The Concert For New York City", held mere months after 9/11, with that of scenes of McCartney himself as he walks the streets of the town that his former songwriting partner, John Lennon, loved so much. "It was an honor to be able to help New York and America at that time in its history,” said McCartney of the concert. "There was a feeling of shock and fear in the air that I thought we could help alleviate with music and the fact that so many people stepped up to join us made for a very uplifting evening for us all." Recorded in DTS-HD Master Audio, Dolby Digital 5.1 and LPCM Stereo, the 90-minute film features cameo appearances by President Bill Clinton, Mick Jagger, David Bowie, Eric Clapton, Sheryl Crow, Leonardo DiCaprio, Harrison Ford, Jay Z, Billy Joel, Elton John and many more in onstage and backstage moments. It is a film that no music fan can afford to miss. Been a long while since I've written. Hope everyone is well. (a McCartney sound in particular). I'd heard the similarity to the "Paul" sound, put the screws to Rhodes' career. Talented guy though. Love the newsletter and cool reads. Thanks for doing all you do! Kickstarter is an all-or-nothing web based campaign, so the goal of $50,000 must be fulfilled by 11-11-11 or the filmmakers get NOTHING. It's been 50 years (!) since Freda Kelly began her work for the Fab Four and this movie will be the first time she's sharing her memories, so let's make this Kickstarter campaign go viral and help these filmmakers preserve Freda's stories forever! My name is Dollena Campbell and I am the producer of "Searching for Terry: Discovering a Guitar Legend" that is directed by Terry Kath's daughter, Michelle Kath (who was three at the time of his death). Our kickstarter can be seen at www.fundsearchingforterry.com or http://kck.st/nSqGES (either can be provided for your fan base). We're currently on kickstarter at 52% with 10 days to go, and need at least $17,500 more (kickstarter is all or nothing so if we don't reach our goal we receive $0 of the funds raised) and we're hoping to spread the word about a wonderful documentary about one of the most underrated guitarists, Terry Kath, whom Jimi Hendrix praised as one of the best guitarists before Terry's death. It's possible, with the help of the press, to alert the fans. Last week we leaped by over $14,00 but we need to make sure that the fan base is aware in blogs, and newspapers that they (and we) respect. We're hoping you might review with a link and also place us with a link on your social media rotation (with a link) via your website, newletter, email, spread to any guitar lovers or teachers or blogs, twitter, and facebook and request support if you love what you see. And of course whatever you can do is much appreciated. Anything you can do is appreciated to spread the word. We are grateful to find partners and press who who believe in what we're doing because Terry truly is amazing and underrated (play the clip to see). Right now Chicago the band has placed us on their website, reviewed, and tweeted in addition to guitarsite.com, and also guitar.com, but we would love to expand our audience. It is our hope to exceed the goal (as anything over the goal will go to post production, distribution and outreach costs). thanks so much! items that will only be given to backers of the documentary (numbered). deeply, soulful voice. Jimi Hendrix famously praised him as being the better player. During the course of nine years, Terry Kath and Chicago released ten albums, including a greatest hits album and toured nonstop. By the mid 70's, Kath became disheartened by the music industry and life on the road. At 32 he died of a self-inflicted gun wound to the head, leaving behind his wife and young daughter. This is a film by Terry's daughter, Michelle Kath Sinclair, who was only three years old when he passed. The film will explore Michelle’s journey in learning about her father’s life, through a series of interviews, live concerts, and never-before-seen home video footage shot by Terry Kath himself. Using interviews with Chicago band members (past and present), family, and contemporary musicians, the documentary seeks to highlight the musical legacy of Terry Kath. Weaving through this very intimate exploration, the film will also celebrate the history of Chicago as a band in the context of the cityof Chicago's music scene in the late 1960's. The film is a coming of age documentary of a woman in search of her father’s identity, both as a rock icon and as a creative master. Michelle must take the audience on a journey that digs beneath the public surface. She hopes to learn more about Terry's personal struggle against the pop machine in favor of his quest for creativity and reveal the highs and lows of a turbulent rock scene. She seeks to discover the secrets behind Terry's great talents, including his musical influences and demonstrate in turn how his music has influence another generation of artists. As a working DJ in the LA music scene, she realized that her generation experiences Chicago through samples and remixes from artists like Fat Boy Slim, Girl Talk, De La Soul, The Bucket Heads and Pitbull to name a few. Her goal is to present an in-depth portrait of her father’s creative process and share it with a new generation of music groupies. Our mutual friend Mark at Oldies Paradise thought you might be interested in helping spread the word on this Rick Nelson TV show fund drive. I just wanted to pass along a juicy bit of info for you. Sam Nelson (the son of the late Rock and Roll Hall of Fame inductee, Ricky Nelson) plans to restore the entire 14 year (435 episodes) series of the longest running live-action sitcom in the history of television - "The Adventures of Ozzie and Harriet." The family hopes to get the series restored by the time the show is inducted into the Smithsonian. The entire project is going to cost $56,000, but he's raising the money in a unique way. Sam wants to get the fans of the show involved in the project and has created a fund for people to donate money, from now until November 3, to this labor of love. And, for pointers on how to make a GREAT music documentary film, ALL of the above would do themselves well to check out the Reeling In The Years DVD Release "Look Through Any Window", a 3-hour history of The Hollies. They just don't come much finer than this!!! I have to weigh in on the Hollies' "Sorry Suzanne". Great harmonies as usual, great instrumentation and great composition. I put it second only to "The Air That I Breathe" as the best of the Hollies' handiwork. I would play it continuously but I'm afraid of turning into one of my sisters. Here's another Hollies track that I've been listening to quite a bit lately. I know this is one of your favorites ... and I can honestly say that this is the first time I've ever clearly understood some of the lyrics to this song! The Hollies do a beautiful job on "A Whiter Shade Of Pale" ... especially when you consider that this is a LIVE performance! I know there are several threads on this kicking around here but you can never have enough Hollies threads. So, I've been a fan of the Hollies since I was a kid. In the CD era of course I grabbed all the Hollies I could find, especially the stuff in the late 1980s and early 90's before Abbey Road Mastering discovered No-Noise. I play Hollies stuff all the time, they don't sound old or dated to me at all. And just a few years ago on a lark I bought a minty Parlophone 45 of ON A CAROUSEL and was astounded at the sound quality and the fantastic mono mix which had only heard on AM radio way back when. Well, I quickly grabbed all the British Parlophone 45's I could find, having come full circle with my Hollies collecting. This new DVD (part of the "BRITISH INVASION" series ... see my earlier reviews) is something that I really wanted to watch. So, happily I received my gratis copy today, courtesy of the DVD's director David Peck of Reelin' In The Years Productions. Thankfully Eagle Rock Entertainment decided to distribute this worthy DVD (it was in doubt if this would even be released for a while) and let me just say that all music lovers should grab this while they can. This is a keeper for your collection, just as important as your favorite Hollies' LP or Parlophone 45. David didn't ask me to write a review, didn't even mention it, but I am compelled to plug this thing and I'm gonna. It's essential if you care for that era or its music. I popped the DVD in my machine late this afternoon and was amazed at the footage, sat spellbound and when I looked up, 185 minutes had passed by and it was night outside. It seemed like a dream when it was over, couldn't believe I blocked everything else in the world out, so eagerly did I devour this great music documentary. You'll see 22 great Hollies performances, you'll hear insights from the band members, you'll see old home movies, you'll remember favorite songs and go "Oh, that was the Hollies, gee they had more hits than I remember" and so on. I'm usually not a fan of modern interviews with band members (they tend to focus on past wrongs and not the music) but these interviews were VERY interesting. When Nash talks about leaving the Hollies and the UK on December 8, 1968 and two days later he was in the studio in Los Angeles with Stills and Crosby it gave me quite a jolt being that I'm working on mastering that first CS&N album right at this time. For me watching this DVD was like a bridge between two musical worlds. At any rate, the Hollies seem like nice guys, I've met several of them before but it was nice having all of this info and footage and music all in one place for a change, and a few of these music clips I've never seen in my life and wow, what a thrill, trust me. At any rate, grab this. And soon. Nothing stays in print forever, dudes. I have spoken! Did you happen to see this headline last week? http://wcbsfm.radio.com/2011/10/18/aaron-eckhart-cast-as-beach-boys-drummer-dennis-wilson/How did Martin Scorsese miss this one? He got George Harrison & Tommy James. He seems to be leaning in a Musical Direction, if you know what I mean. As far as I was told, Alan Parsons isn't much of an actual producer. With Pilot, all he did was "mix" the song, "Magic", nothing more. Certainly not my idea of a producer, but anything goes with who is credited. But a great tune Magic is / was! I don't know if I can agree with you on this one ... Parsons has certainly been at the right place at the right time a number of times over his career, working first with The Beatles at Abbey Road and then the landmark Pink Floyd album "Dark Side of the Moon". Not too many folks around who can post THOSE kinds of credits on their resume! Between 1959 and 1963, Neil scored 14 Top 40 Hits, a pretty remarkable run ... but then The British Invasion hit. Unlike many other artists, Neil bounced back in the '70's when he signed to Elton John's Rocket Records label ... and ran up a string of seven MORE Top 40 Hits, including the chart-toppers "Laughter In The Rain" and "Bad Blood", sung with Elton John himself! Neil collected his 22nd Top 40 Hit in 1980 when a duet with his daughter Dara, "Should've Never Let You Go", went to #19 on Billboard's Hot 100 Singles Chart. 10/21/2011 – Asheville, NC – Much to the excitement of music fans across the globe, on October 25, 2011, legendary YES vocalist Jon Anderson will release as a digital download an epic musical work entitled "OPEN." A return to the long-form composition that Jon Anderson is best known for, (“Close To The Edge”, “Gates of Delirium”, "Revealing" and “Awaken”), OPEN is a 21-minute exhilarating musical journey; a pioneering effort that weaves intricate melodic and harmonic themes within a classical music framework whilst showcasing Anderson's iconic vocals and timeless melodies throughout. In many ways OPEN is a return to Jon Anderson's musical roots, as YES music continually flows through his veins, making it only natural to revisit now and again. Coupled with wonderful orchestration by his neighbor and good friend Stefan Podell, messages of peace, love, light and freedom are further explored within OPEN, making listening an uplifting and joyous experience! It has 4 movements all intertwined, and seems to have a life of its own. For those who love this kind of music, I feel so happy to present it as one of many I hope to create over the coming years. My love 'Janee' has helped in production with her unique musical observations and her angel voice. I am so happy and thankful ... Many Blessings." It's been five years since the release of Nils Lofgren's last studio album featuring his own songs and, with his forthcoming release titled, Old School, he's got something to say. An effort that's been in the works since the culmination of Springsteen's Working on a Dream Tour in November of 2009, Lofgren's Old School covers a variety of topics including desperation, self-doubt, true love, departed friends, holding on to your dreams and the world gone mad ... along with a tribute to the late, great Ray Charles. "These songs reflect characters with some radical feelings and beliefs," states the singer, songwriter and multi-instrumentalist Lofgren. "They're definitely thought-provoking." The CD -- due out on Tuesday, November 1st -- will be his eighth studio release on Vision Music, the label also responsible for 2008's The Loner - Nils Sings Neil (an homage to Neil Young, whom Nils started his career with over four decades ago) and 2006's Sacred Weapon. "Old School has many different types of songs and feels ... some rough, bluesy tracks to haunting acoustic songs," continues Lofgren. "There's some interesting and controversial characters in these songs and I look forward to everyone's reaction." The album starts off with the controversial title track, "Old School," which features former Foreigner lead singer Lou Gramm. oh no ... ain't no old school anymore ..."
It's not for the timid. Old School features a total of a dozen songs (see below for track listing), all produced by Nils with the exception of the song, "Why Me," which was produced, recorded and mixed by Brian Christian (Alice Cooper / KISS / The Babys fame). The song, "Amy Joan Blues" features legendary vocalist Paul Rodgers while the cut, "Ain't Too Many Of Us Left," features Rock Hall of Fame inductee Sam Moore from the popular sixties duo Sam & Dave. Sam Moore comments about the collaboration, "It hit me when I was in the studio with Nils that we've lost so many of our friends, peers and colleagues in the past few years ... The Big Man, Billy Preston, Wilson Pickett, George Harrison, Solomon Burke, Johnny Cash, Isaac Hayes. It hit me how true it is that there 'ain't too many of us left.' I was flattered and honored that Nils asked me to join him to pay a little honor and remind everyone in some way to remember our dear but departed friends and loved ones." "Ain't Too Many Of Us Left" has been made available as a free download at www.nilslofgren.com for fans to enjoy and the entire CD can be pre-ordered on the site as well. Also appearing on Old School is the song, "Irish Angel" (written by the great Bruce McCabe) that Nils has been singing for years at his acoustic shows along with a ballad Nils wrote with an old friend and great DC-area artist, Root Boy Slim, called, "Let Her Get Away." "I've always wanted to share that particular song but never got it together until now," says Nils. "Sadly, Root Boy's not with us any longer, but I know there are fans out there that will appreciate this touching, haunted country-type ballad of ours." Speaking of old friends near and dear ... Old School is dedicated to Nils' dear friend and band mate, Clarence "Big Man" Clemons. 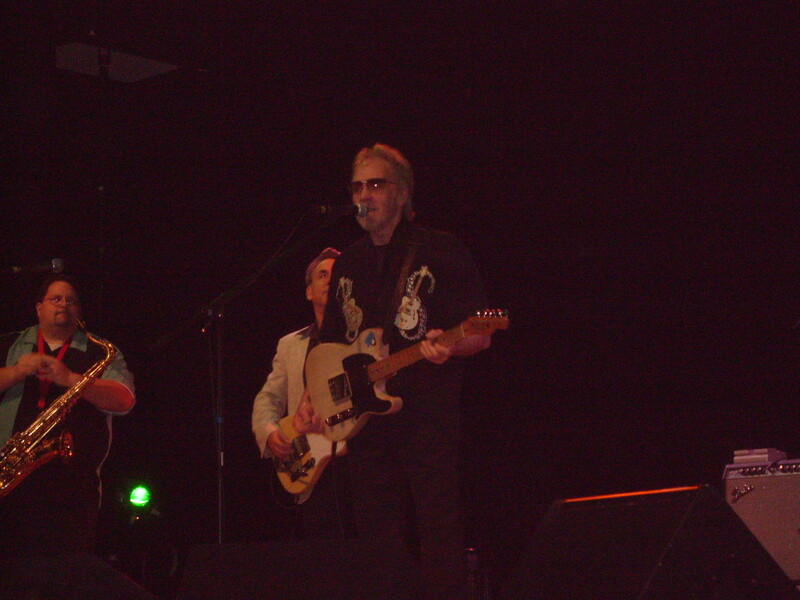 As an integral member of the Bruce Sprngsteen's E Street Band since 1984, Nils has remained consistently busy as part of the group, and as a solo artist. In addition to songwriting and performing, Nils also devotes substantial time to his online guitar school (http://www.nilslofgren.com/Lessons07.html), which has garnered tremendous response from guitar players all over the world. Beginner lessons are offered in English, Spanish and Italian. In early September, Nils released "When You Are Loved" (via free download on his site), a 9-11 song that honors heroes, victims and families. Beginning today, Nils hits the road for a few dates (see full itinerary below) to talk up the album and have some fun. He'll travel from town-to-town, playing his favorite songs in intimate venues, talking to friends and fans ... something he's enjoyed for 43 years now. Furvus of The Fifth Estate here. and the TIME TUNNEL album will be coming through on 11-11-11!! And maybe just a reminder to any of those who have already written in earlier, or are about to, requesting those initial Shel Talmy and Fifth Estate autographed CDs. It is time to put your $11.99 where your earlier email request was, if you haven't already. Maybe also just a note as to where we are coming from with this album. This may help on first listen. We did not do this as a contemporary type album at all. In many ways it is contemporary, but from a musicologist's point of view! If anyone can figure out what that means?? We can't. Of course there are some improved sound qualities these days which we took advantage of, but basically the album is written, played, recorded and produced just as a 1965, or there about, album would have been done. It all is just the four of us playing, singing, writing and sounds like us from track to track, but there is a pretty fair spread of material and approaches taken for some of the songs. Maybe like listening to your favorite radio station in the mid 60s would have had, we hope!! Crazy Little Thing could sound like us doing one of Elvis's big tunes. Things Change could be a rock and roll ballad by one of my favorite somewhat forgotten hit makers, Jimmy Clanton, but done a lot like maybe The Beatles would have done Please Mr. Postman. There is definitely some Kinks and Who influence in here as well. We couldn't resist. But it all ties together somehow, mainly we feel because it is really just what the Fifth Estate has always done, right down to the harpsichord in some songs and Honky-Tonk piano in others. This is really an exciting time for us in the band and maybe by this album we can pass just a little of that excitement along to our listeners. There are also some fairly interesting stories about the recording of this album, working with such a great producer, and about all the differences between getting something recorded and out these days as opposed to back in the day. Maybe at some point here we could share some of that, but that would probably all be much more enjoyable once people have had a chance to hear the album if they care to. We hope they do! Dawn Lee Wakefield has written an excellent piece on our FH friend Artie Wayne for the Examiner. Check it out. Thank you for featuring a Jack Scott song as your 'Today's Forgotten Hit' selection. After all, the man had FOUR Top Ten Hits - yet you won't find radio playing ANY of them! Earlier this year, Jack Scott (a Forgotten Hits Reader) sent me an email asking if I'd be interested in doing an interview for the website. Naturally, I immediately said "Yes" ... but then for the next two months not a single one of my emails received a response. I finally heard back from a mutual acquaintance who told me that Jack was going to be co-writing his autobiography and "didn't want to give too much away" ahead of time to our readers. Not doing an interview with you is Jack Scott’s loss. And, speaking of Tom Cuddy ... and Jack Scott ... here's a review we received last week of a recent Jack Scott appearance with ANOTHER Forgotten Hits Reader, Gerry Granahan!!! Pioneering singer-songwriter-label owner and producer GERRY GRANAHAN of East Greenwich, Rhode Island, was inducted into the HALL OF FAME of the Rhode Island Music Hall of Fame during a performance at the Rhode Island Center For Performing Arts in Cranston, Rhode Island on October 15, 2011. A native of Pittston, Pennsylvania, Mr. Granahan, 79, began his career as a local disc jockey before relocating to New York City at the dawn of the rock’n’roll era. Granahan began recording for Atco Records, along with his one-time roommate, Bobby Darin, and recorded a publishing demo for Elvis Presley at Hill and Range Music before scoring his first national hit on the Sunbeam label, “No Chemise, Please”, in 1957. As the man behind Dicky Doo and the Don’ts, he wrote, produced, and sang lead on the national best-seller, “Click Clack”. Granahan earned his third gold record award for “You Were Mine”, a song he produced and sang with Ritchie Adams that was released under the name the Fireflies in 1959. Despite a handful of successful solo records including “Dance Girl Dance” and “Let The Rumors Fly”, Granahan gravitated toward the production end of the business, owning Caprice Records and producing a wealth of diverse artists including the Belmonts, Five Satins, Angels, Janie Grant, James Ray, Patty Duke, Pat Cooper, Lee Greenwood, Lyn Roman, and Jay and the Americans, whose United Artists’ hits “Cara Mia” and “Some Enchanted Evening” benefited from his in-studio talents. By the early 1970s, he had retired from a vice-presidency at Dot Records and relocated to New England. Mr. Granahan’s last performance in the New England area was a 1988 date with Fats Domino at the Warwick Musical Theater in Warwick, RI. He performed in concert on an all-star bill of Rock 'n' Roll and Doo-Wop stars. Also on the bill were JACK SCOTT ("The Way I Walk", "Burning Bridges", “What In The World’s Come Over You”) and the hit-making amalgamation variously known as THE VIBRATIONS ("My Girl Sloopy", "The Watusi"), THE JAYHAWKS ("Stranded In The Jungle"), and THE MARATHONS ("Peanut Butter"). 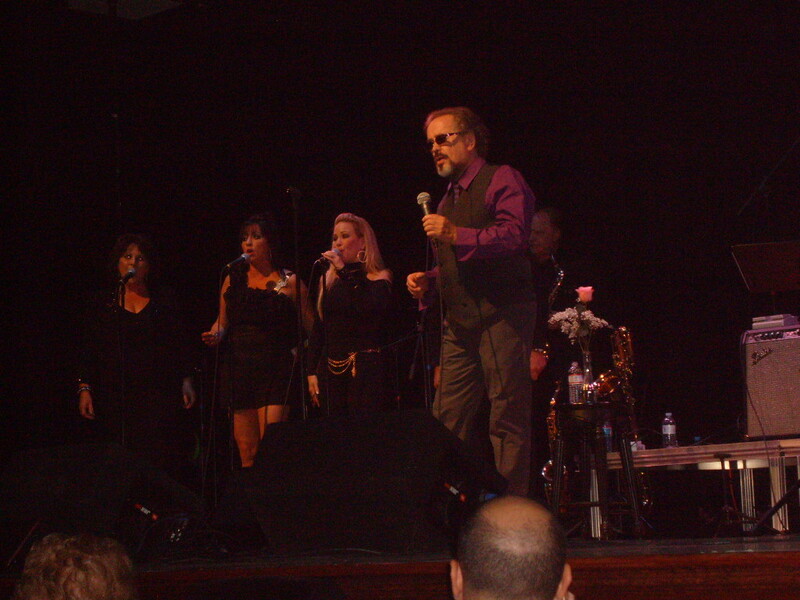 Photo attached is Gerry Granahan singing last weekend in RI. Two of the background singers are his daughters. Exclusive photo for Forgotten Hits by Steve Hill. Carl's birthday was the 17th ... mail we're just first opening five days later!!! As a longtime follower of your site, I always look forward to your latest edition. And even commenting at times. I want to give a huge THANK YOU for the support and latest mention of http://www.rockandrollheaven.net. As one of Mason Ramsey loyal followers. It's always great to spread the word about the progress and user friendly site. Mason's a great guy. Not to mention a good friend. I sure hope we get him back on our computers or radio LIVE once again. So a huge thanks to you for all your support and saying such nice things. Love your site as well. It's the "Guess The Guest" Weekend on WCBS-FM. I tell you, I didn't know about any of this information. This is neat. It's sort of a time machine of music. Each of the years below connect to the best 20 hits of that year. Pick a year, wait a few seconds, and the Juke Box will show you the 20 hits to select from. You can play all 20 hits, or just those that you like. Top 20 - 1940 to 1999. Please pass this message on to your readers. As you know the Jersey Girls Website -- owned and operated by Denise Ferri of the Delicates (Murray the K's Original Dancing Girls) and Bernadtte Carroll of "Party Girl" fame -- is dedicated to keeping the wonderful music of the 50s and 60s alive. With this objective in mind, the girls and I have created a personal sampling jukebox which is available on that Home Page. I believe that anyone who is a lover of national hits from the 50s and the 60s will appreciate this. For the past few months, when you visited the Jersey Girls Sing Home Page, you heard a recording chosen randomly by the computer played in its entirety (if you chose to listen all the way through) by either the Delicates or Bernadette or Clay Cole or (gulp!) myself. We've changed that so that now, when you visit the Home Page, you will instead hear a national hit recording chosen randomly by the computer which falls within the time period of 1950 through 1965. But, admittedly, it may or may not necessarily be one that will make you jump and and down and say "wow"! With that in mind, we've created what we call a "you-select-it" sampling jukebox which enables you to sample -- from the Jersey Girls Sing Home Page -- the first 30 seconds of several thousand nationally charted hits from 1950 through 1965. Currently the available recordings are national top ten hits from 1950 through 1954 and national top-60 hits from 1955 through 1965. (1) If, based on your criteria, there's more than one possibility, a command button pops up with the words "PLAY ONE OF THE #### RECORDS" where #### is replaced with the number of possibilities. If you click on that button, the computer will randomly-choose one of the possibilities and will instantly play the first 30 seconds of that recording. The textbox background color will turn YELLOW which indicates that there are more than one possibility. (2) If, based on your criteria, there is only ONE possibility, the computer will instantly play the first 30 seconds of that recording. The textbox background color will turn GREEN which indicates that there is only a single possibility (which is the record that is playing). (3) If, based on your criteria, there are NO possibilities, the text box background color will turn RED to indicate that there are no possibilities. If you feel that the record "should be included" based on the parameters mentioned above, check to make sure that the consecutive letters you entered in the "find" text box are correct. If something is not included that you think should be, please by all means write me at RonnieOldiesGuy@aol.com and let me know. The search criteria in the "find" text box is immediately analyzed as each successive character is entered or deleted. To make the search as simple to use as possible, records are stored internally by title and artist concatenated in lower-case characters with spaces and special characters omitted. So, for example, "I've Told Every Little Star" by Linda Scott is stored internally as ivetoldeverylittlestarlindascott. The search algorithm internally converts what you put in the text box to lower-case characters and, as noted above, ignores spaces and special characters. If your search box contains starlinda there would be two possible matches: "I've Told Every Little Star" by Linda Scott and "Count Every Star" by Linda Scott; entering littlestarlinda would result in only the former record being a match. Entering beatl presently results in 32 possible matches; all of them contain the word "Beatles"; however one of those matches is not a Beatles hit, namely "We Love You Beatles" by the Carefrees; entering thebeatl would exclude that record and would generate 31 possible matches. In the case of the Beatles (let's stick with the 32 possibilites) if you press the "PLAY" button 32 times you will have each of those possibilities play exactly once: none will repeat within those 32 clicks. If you click a 33rd time, then a new "no-repeat" cycle will begin. There is also a "REPLAY" button which appears at appropriate times, giving you an easy way to repeat the 30-second sample that you just heard. That's all there is to it. Once you navigate away from the Jersey Girls Sing Home Page, any record that is playing will automatically stop. You can also control what you hear using -- for instance -- the pause and stop buttons on the displayed player. Pressing the F5 function key (for most people) will refresh the Jersey Girls Sing Home Home Page and bring in a new computer-selected "start off" record and provide you, once again, with all the search options described above. I hope that you'll try this and please feel free to email me at RonnieOldiesGuy@aol.com with your comments about the existing process and suggestions for the future. Though all the tracks will play, I am aware that there are a few errors in the listings of some titles and artists. Occasionally the displayed title will be truncated (missing words or characters). We will try to correct all of these as soon as possible. But if you notice one right off the bat that isn't right, please send me a message. Thanks in advance for trying out the process and for any feedback that you may provide. Going back to what you said about Janis Martin and the some 750,000 copies of DRUG STORE ROCK AND ROLL which she reportedly sold according to RCA on the liner notes on my album of hers, you could be right in that it could be nothing but 'hype'. It seems to me that years ago I read in some of my books here at home that Screaming Jay Hawkins recording of I PUT A SPELL ON YOU was a million seller. Also, the Rock and Roll Trio's recording or TRAIN KEPT-A-ROLLIN' sold some 750,00 copies. These never made the national charts as far as I never. Some regional charts from what I know. If these numbers were 'hype' on these records, then not much royalties would be coming to these artists. In 1956, Martin released her debut record under RCA, "Will You Willyum", backed by her own composition, "Drugstore Rock'n Roll". The song became the biggest hit of her career, selling 750,000 records and hitting the country and pop charts. Soon Martin was performing on American Bandstand, The Today Show and the Tonight Show. She also appeared on Jubilee USA, and the Grand Ole Opry in Nashville, Tennessee, becoming one of the younger performers to ever appear. Billboard named her Most Promising Female Vocalist that year. Saturday (Ocotber 22nd) marked the debut of ZZ TOP’s La Grange Fest in Austin, TX. It was a ZZ Top-hosted music festival held at Austin’s The Backyard. Featured along with ZZ Top were Lynyrd Skynyrd, Jamey Johnson and Corey Taylor. Skynyrd and ZZ Top have a relationship that dates back to the early 1970s and they have worked together extensively ever since. They’ve most recently shared concert bills on the Rebels & Bandoleros Tour. Jamey Johnson is one of the key contributors to the just-released A Tribute From Friends, the album of ZZ Top cover songs by a slew of the band’s admirers including Nickelback, Grace Potter, Daughtry, Wolfmother and The M.O.B. (Mick Fleetwood, Steven Tyler, Johnny Land and John McVie) and others. His contribution to the collection is, appropriately, “La Grange” with none other than ZZ ax man Billy Gibbons guesting on the track that’s the album’s closer. Corey Taylor is a recent addition to La Grange Fest’s line up and he performed an acoustic set on Saturday. Taylor is the multiplatinum selling, New York Times best-selling author and Grammy® Award-winning singer/ songwriter in Slipknot and Stone Sour, two of the most successful bands in rock music today. ZZ Top’s La Grange Fest performance was carried live over SiriusXM’s Outlaw Country, channel 60 ... it marked the band’s first real time live broadcast to be heard in North America over the course of their career spanning over 40 years. La Grange Fest is a reflection of the ZZ Top tradition of raucous revelry set to a down ‘n dirty beat. It takes its name from the band’s ode to the Texas town that was home to the notorious “Chicken Ranch,” later the subject of the musical “The Best Little Whorehouse In Texas”. Billy Gibbons, discussing the forthcoming show last week, noted, “We’re looking forward to having a good time with all of our friends and fans on the 22nd. Down Austin way is gonna be the place to be that day, doncha know!" La Grange Fest reconnects ZZ Top with its Texas roots and legacy quite specifically. Just this year the band received the Texas Cultural Trust’s 2011 Texas Medal of the Arts and was previously named “Official Texas Heroes” by the state’s House of Representatives. The Texas Commission on the Arts has named Billy Gibbons as 2012 Texas State Musician. In recognition of the heroic efforts of so many Texas firefighters during the recent spate of wildfires in the state, La Grange Fest attendees were asked to donate to the Texas State Firemen’s and Fire Marshals’ Association, the Lake Travis Fire Department and the Bastrop Fire Department. Do you think we should talk about his unsolved Murder? Any new information to report? Bobby would have turned 69 on October 22nd. I don't know if anyone if going to complain but nowadays I don't see anything wrong with having a FH of the day from 1981. The way I look at it is that if someone graduated from high school that year, they would be some 48 years old and that song would be considered to be an "oldie" to them.